Dear readers, I’m taking a detour from my usual kind of post because of a couple of things that happened in the science writing world in the last week. I beg your momentary forbearance…. I like to think that I work in a profession, time and place where misogyny and sexual harassment aren’t an issue, that they’re something we’ve evolved beyond. I’m old enough and have been around long enough to know better. My glasses should have lost that rosy tint a long time ago. But I’ve still been left reeling by two events in the last week. First, biologist Danielle Lee revealed in a post on her blog, The Urban Scientist, that she’d been harassed & insulted by an editor at Biology-Online.org. (Specifically, when she declined an invitation to write for them for free, the editor who had contacted her called her a whore. Whaaat?!?) What then set off a firestorm was that Scientific American, which runs the blog network on which The Urban Scientist is hosted, took down her post without warning or, to many, sufficient explanation. Their reasoning, according to SciAm’s editor-in-chief, was that the facts of Lee’s allegations had not been verified; my guess is some in their legal department started screaming “LIBEL!!! !” Lee’s post has since been republished, and the offending editor at Biology-Online fired. Second, two women, Monica Byrne and Hannah Waters, revealed that they had been the victims of sexual harassment by Bora Zivkovic, the blog editor for SciAm and a man considered a lion in the field of science blogging and communications. Zivkovic has admitted to the incident with Byrne; as of when I wrote this, no reaction yet regarding Waters. It’s been a bad week for SciAm. More than that, it’s been a bad week for science communications. I barely know Zivkovic; we met briefly at a conference last year, and we’ve interacted a couple of times on Twitter. But it’s widely known through the community that he has been a booster for young women in science writing, advising them and helping their names and work get some visibility in the community. I believe the accusations 100%, from minute it broke there was no doubt in my mind. Very sad about it all, reflecting on my own interactions. What Hannah wrote resonated a lot with me, I think we’ll come to find this doesn’t stop at two women, [I] strongly think there are others. My field, science communications, covers — nay, revels in — what goes on in another field, scientific research. Apart from an intense curiosity about how the universe works, both fields have another thing in common: an organizational and power structure where there are a lot of women at the low- to mid- career tier and a lot of men in positions of power. Our’s is also becoming a bit of a crowded field, because there are many, many young people trying to get into science writing and communications. I’ve definitely noticed an increase in interest in the field in the last 5 years, at a time when the number of full-time employment opportunities has gone down. Which brings me to my next point. In science writing, there is a heavy focus on freelancing, in which writers’ work and paychecks are very much at the mercy of editors and managers. This makes the power gap even worse. Essentially the problem, he promotes all of the young female sci writers, many myself included credit him with launching their careers. Start to feel like you owe him silence, or like you should brush off comments, protect his reputation and yours. Also want to think that you are wrong, that you misinterpreted, hell even misheard. I look at all of these incidents — Lee’s abuse, Waters and Byrne’s harassment — and the words that keep drumming in my head are: This is wrong. This is so so so wrong. Gentlemen, men, guys — we are supposed to be better than this. Yeah, I know workplace sexual harassment happens, but I honestly never thought I’d encounter it in science writing. My anonymous colleague and I, we should never have had to have that conversation. I’m small potatoes in the science writing field; on that, I have no illusions. That being said, I too like to try to help out burgeoning science writers in what ways I can. Those conversations — the ones that involve networking and mentorship, that are based on respect — those are the ones we should be having. It saddens me guys still do things like this & makes me doubly aware to constantly assess my own conduct. So what happens next? 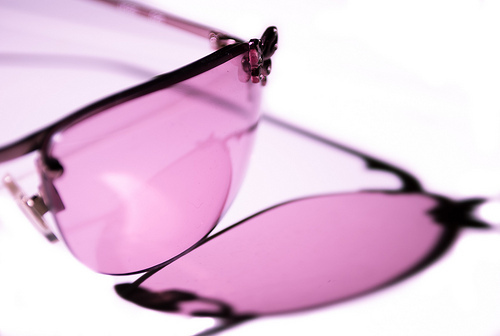 My rose-colored glasses are off, and I want to do something about it. Our community, such as it is, is bruised and needs to be mended. We need to talk more openly about the lack of women in positions of editorial power. About the freelancing structure of our field and how to make it work better. About opportunities to help those just starting out. About how we address and avoid hurts in a decentralized work culture like that of so much of science communications. Above all, we need to talk about how to show more respect to each other — words that I can’t believe I have to write, because the science writers I’ve interacted with, especially in the last year since I’ve started to get more active, have been some of the most respectful women and men I’ve ever met. …to insist that there be consequences for people who engage in inappropriate behavior regardless of whether they were aware that their behavior made someone uncomfortable at the time. I participate in two science writing groups in Boston, New England Science Writers (where I’m a steering committee member) and Science Online Boston (aka ScioBeantown, where I’m occasional event attendee). We have three science communications programs here in the area, one at Boston University and two at MIT, and an active community of people engaged in all kinds and levels of science communication. And they care. They truly do care about having a community is respectful and fair. I want to do what I can toward that goal. I hope they will join with me. We’re all responsible–and not in a blaming the victim way, but for enabling power and pay structures, including a freelance model that has become so distorted and lopsided. We need to respect and promote the value of good writing … not take advantage of young (or just plain hungry) writers, whether they are women or men. As a science writer, I appreciate the opportunities I have, but I know that men are given more respect and attention by magazines and other publications than I am. Frankly, the main thing that has opened doors for me has been my engineering degree. And most female science writers don’t have degrees in mechanical engineering. I’ve worked for an organization that promotes women and minorities in STEM before, so I know it is an uphill battle to reduce the barriers that we face. Fundamentally, I am concerned that there seem to be few people in leadership positions and editorial roles in the science writing and magazine publishing worlds who are willing to stand up to the dominant cultural assumptions that women are less qualified than men are and are not really experts in their subject matter.